World number two Novak Djokovic says he hopes to return in two weeks' time after his wrist injury was found to be not as serious as first thought. 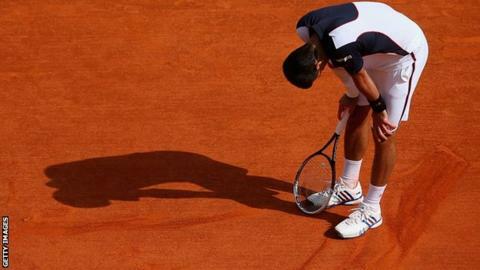 Djokovic had claimed he would be out for "some time" to let the wrist heal after exiting the Monte Carlo Masters. But the Serb, 26, is now optimistic of being fit for the Madrid Masters in a fortnight. "However, I need to continue with the recovery process and full medical treatments. It means I will have to take a short break in order to recover as soon as possible." The French Open is the only Grand Slam that Djokovic has yet to win, although he came close to beating Rafael Nadal in last year's semi-finals before losing in five sets.